Travel: Lets Take A Road Trip! We drove late Wednesday night from Vancouver to Portland and spent the night at a cheap hotel just off I-5. It took about 8 hours with traffic and by time we were in our hotel bed we were pooped! The Thursday we drove 12 hours from Portland to Redding, CA. Out of the 2.5 days of driving this was the most scenic day. We drove through thunder and lighting storms, farmer fields that seem to go for miles and when we finally crossed the California border line it was nothing but blue skies for days. Friday we woke up early and drove 2-3 hours down to Aptos for the wedding and made it just in time for the rehearsal!I didn’t take many photos of Aptos (my bridesmaid duties got in the way) but it is beautiful! It’s just north of Monterey by 30 minutes. It’s the classic California beach. You look up north and all you see is beach, you look south and you see the same. The people revolve around the beach. At sunset people drive in from the inner cities and setup bomb fires. As a northwest grown girl, it was a very cool experience. The two days at Aptos went fast and before we knew it we were on our way to San Fran! We knew we wanted to explore San Francisco a bit so we designated three nights, leaving one of the days open for a quick trip to Sacramento to visit Finian’s Aunts. 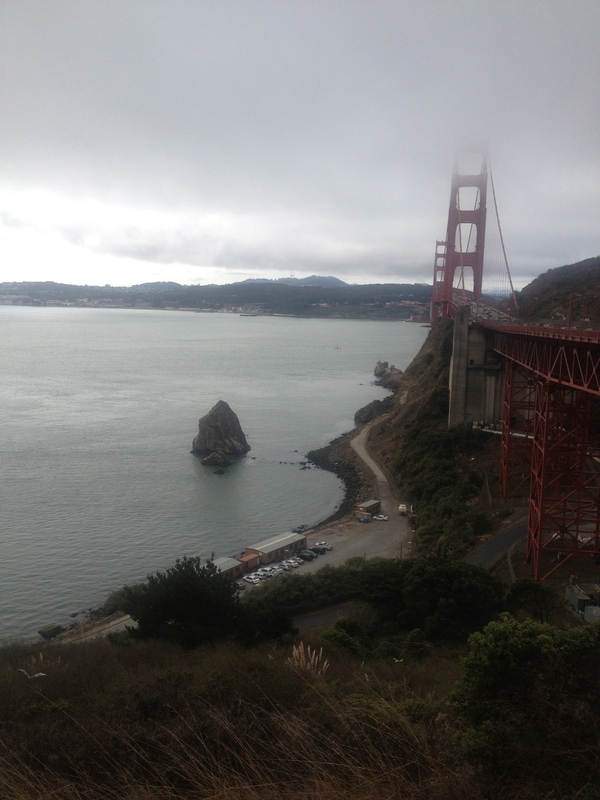 San Fran was all it’s cracked up to be and more! I loved the architecture, the funky and diverse people.. it reminded be of a mix of New York meets Seattle… We stayed in a beautiful apartment I found via Airbnb in the Haight. One night we went to Finian’s first ever baseball game. All in all, I don’t think I have the intensity to live here but I can’t wait to go back to visit. The next day of driving exceeded expectations. It was our favorite day of the trip by far. We left San Francisco early that morning and as we came into the parking lot, the fog lifted revealing the beautiful Golden Gate Bridge. I’m sure you could take hours walking around the visitor centre there but we had a big day of driving ahead of us. We took a few photos and gazed in awe over the beautiful view of the city and then off we went. Highway 101 took us through the beautiful wine country and turned inland a bit through what we thought was a desert. 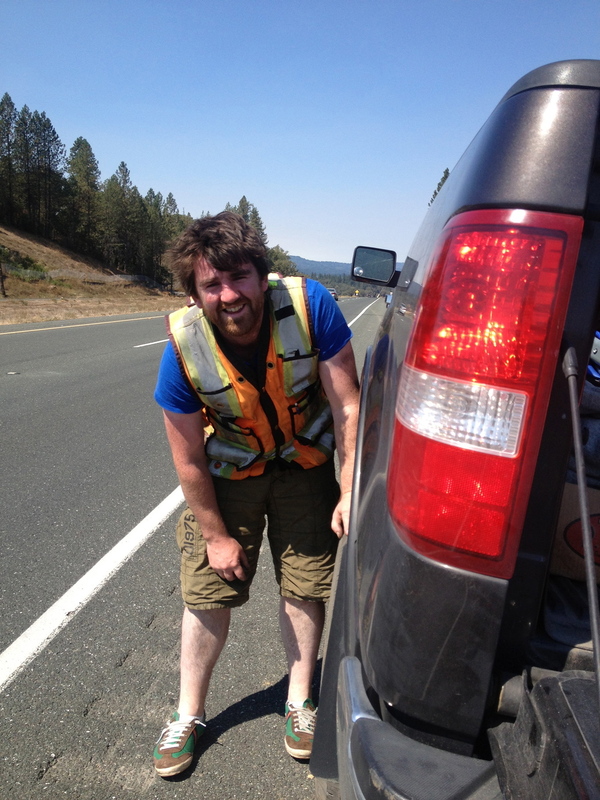 At this point we got a flat tire. Talk about adventure! It was 30+ degrees outside, cars and big trucks zipped by us as Finian changed the tire (for his first time) and as I catalogued the event. 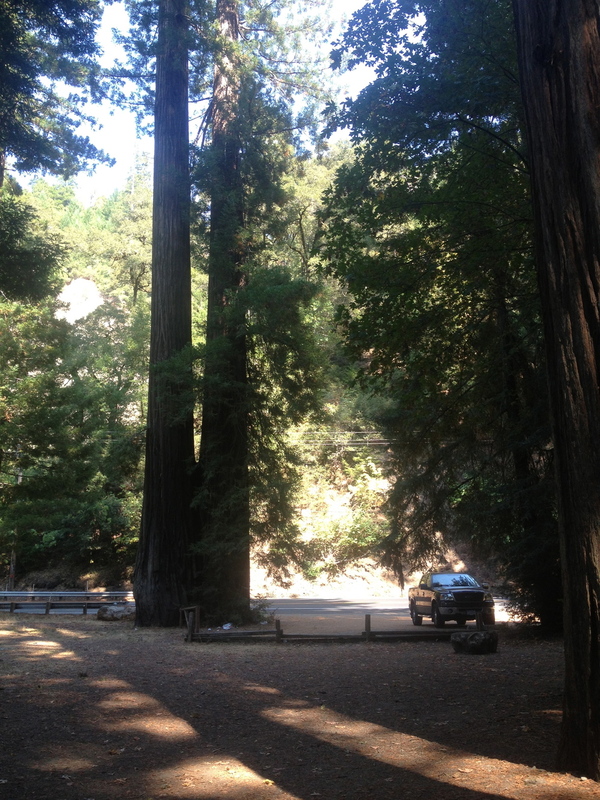 About four hours after that we found ourselves in the Redwood Forest. My only regret on this vacation was not spending more time here. 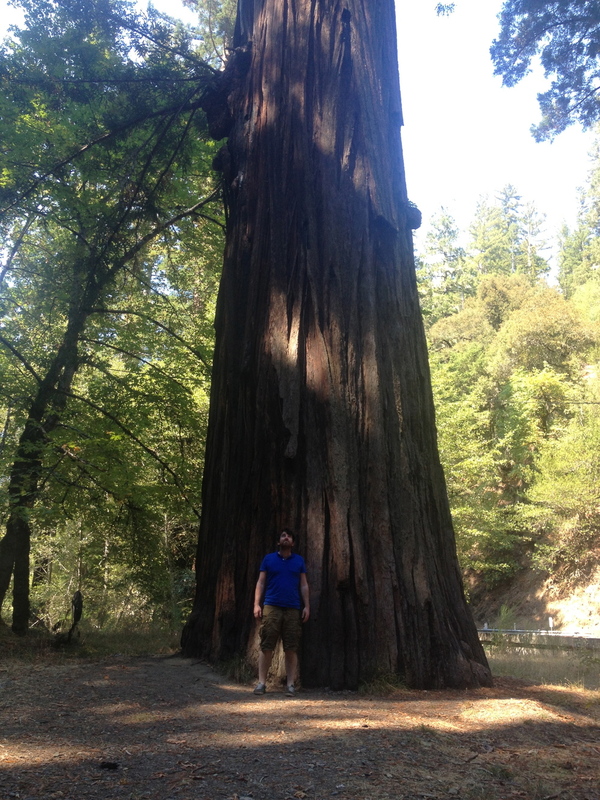 People tell you about the monstrous trees with trunks the size of three F150s. No matter how much you hear or see online, it’s nothing compared to the beauty of standing next to some of the tallest trees in the world. We took about an hour here to walk around and take pictures and it was back in the car again. This time we were racing the sun. We needed to be at our campsite to set up our tent before the sunset and we still had to get our tire fixed. Around 6PM when we cross into Oregon. For the next hour of driving we saw nothing else but elk elk elk. They were everywhere and they were HUGE. And just as the sun is setting, we make it to our first campground at Harris Beach. Perfect ending to a perfect day. The rest of the trip was a bit up in the air… We saw this part of our trip as a No-Plan Plan. We had our reservations, but if we wanted to take an extra night somewhere we could. We heard so many great things about the Oregon Coast and wanted to spend the rest of the time driving up along Highway 101. Oregon National Park Campgrounds are by far the cleanest campgrounds I’ve come across so far. I hardly felt like we were roughing it at all! Our next stop was Nehalem Bay. This part of Highway 101 is beautiful. After every turn is a new vista to woo and awe over. At one point we stopped over to take a look at the big blue ocean and saw a pod of dolphins and seals. Nehalem Bay itself, is a beautiful National Park surrounded by sand dunes. I love this place. The beaches are beautiful and big..even on a busy day it feels like you own the beach. After breakfast at Cannon Beach, we headed to Portland for two nights with our friends. It was hard leaving the Oregon Coast…it is such a beautiful place to explore. Portlandia was great…I felt like all we did there was wait in line to eat, eat, then waited in another line to drink, drank, then did it all over again. Day 10 we left Portlandia for home via a quick visit to Mt. Saint Helens. I hadn’t been there in years and Finian had never been seen a volcano. We were lucky again! As we drove up to the visiting centre, the fog lifted and you could see the whole mountain and the lava fields beneath. It was the perfect end to our trip. I’m not going to lie, this was certainly a packed trip. Some days we drove for 10-12 hours. I wouldn’t recommend this trip to those traveling with small kids or to those who get car sick.. as it’s a lot of driving. But otherwise, I loved every minute of it!